Yanis Varoufakis begins his account of his half year as Greece's finance minister in the left populist Syriza government (Adults in the Room, Farrar, Straus, and Giroux) with a description of a meeting with Larry Summers. According to Varoufakis, Summers explains that there are two types of politicians. There are those who are on the inside and play by the rules. They can just occasionally accomplish things by persuading others in the room to take their advice. Then there is the other type of politician, those who don't agree to the rules and will never get anywhere. Summers asks Varoufakis which type of politician he is. There is no reason to question Varoufakis' commitment. He left a comfortable life as an academic in Austin, Texas, to take up what he certainly knew to be an incredibly difficult job as Greece's finance minister in the middle of a financial crisis. The newly elected populist government was despised by most of the business and political establishment in Greece and across Europe. Only a person with a genuine commitment to the stated goals of the new government would take on this role. But reading his account, it is questionable whether the path he took was necessarily the best one for Greece and for Europe. To give the basic story, at the start of 2015 Greece was being confronted by the joint power of the European Commission (EC), the European Central Bank (ECB), and the International Monetary Fund (I.M.F), collectively known as the "Troika," who were insisting that Greece impose further spending cuts and tax increases even though the country had already endured seven years of depression. I am using "depression" in the interest of accuracy, not exaggeration. By 2015 Greece's economy had contracted by more than 25 percent compared with its 2007 level. Employment was down by almost 22 percent from where it had been at its pre-crisis peak. By comparison, in the Great Depression the U.S. economy shrank by 28 percent from 1929 to 1933, but had exceeded its pre-crisis peak by 1936. Greece will be lucky if its economy gets back to its 2007 level of output by 2027. The Troika had gotten the previous conservative government to agree to a wide range of tax increases and spending cuts that had both devastated the economy and left many of the country's poorest people in desperate straits. They had agreed to large cutbacks in already meager pensions, as well as cuts to a variety of programs designed to serve the poor. The ostensible purpose of these cuts was to have Greece build up a large budget surplus, which would allow it to repay prior loans from the Troika. The budget target demanded by the Troika was an annual surplus on the primary budget, which excludes interest payments, equal to 3.5 percent of GDP (a bit less than $700 billion in the U.S. economy in 2017). The Troika's program also included a wide variety of other demands, including privatization of many public assets and measures designed to weaken the power of Greece's workers. While there was much for any progressive to object to in the Troika's program for Greece, Varoufakis' key point throughout the book is that the program clearly would not work if the point was to get the money back for Greece's creditors. 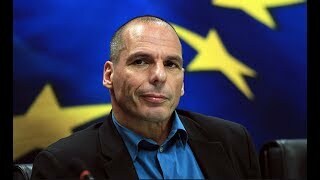 He argues that there was no way for Greece to run the large surpluses demanded by the Troika. This meant that the debt was likely to grow through time rather than shrink. He argued that the only honest route forward was a write-down of large amounts of the debt, admitting that this money was lost. After a write-down, which would free Greece of onerous interest payments, the country could get back on a course of stable growth. The book is a tale of bureaucratic dysfunction and outright treachery. In the latter category we find the Socialist finance minister of France as well as the Social Democratic economy minister of Germany. Both are warm and supportive of Varoufakis in private meetings, but then turn around and condemn Greek profligacy when they speak in public. Any number of other figures accept the logic of Varoufakis' argument in private, including top officials at the I.M.F., but then melt into submission in the presence of German Finance Minister Wolfgang Schäuble, Veroufakis' main nemesis. Varoufakis explains to us his negotiating strategy, and ostensibly the strategy of Syriza government to which he belonged. The goal was to accomplish debt relief while staying in the euro zone. He knew that the Troika would never grant debt relief without some threat. (Why would they give to a populist government that had harshly criticized them a deal that they would not give to a subservient right-wing government?) Varoufakis' threat was to leave the euro zone and establish a new currency.